Xinnia Ramos, Edgar Santiago, Trisha Jeffrey. Click to see in full size. 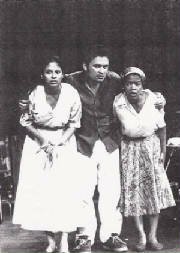 Trisha performed in Lehman College's Studio Theatre in a play called Night of the Assassins by Jose Triana. Directed by Bing D. Bills, Trisha played Beba and also in the show were Xinnia Ramos as Cuca and Edgar Santiago as Lalo.